Home » Articles » Local » Hairbangers Ball and Corporate Rock Heading to The District! Hairbangers Ball and Corporate Rock Heading to The District! Grab your spandex and start teasing your hair now! Hairbangers Ball is heading to the Quad Cities! 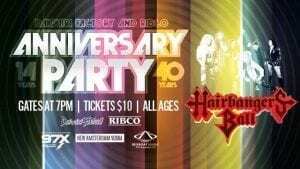 Hairbangers Ball will be rocking the District of Rock Island, along with special guest Corporate Rock, for Daiquiri Factory’s 14th Anniversary and RIBCO’s 40th Anniversary Party! The fun will happen on the stage outside of Daiquiri Factory (1809 2nd Ave Rock Island) on Saturday Jul 21 at 7 p.m.
Tickets for this all ages show are $10 and can be purchased online at https://www.ticketweb.com/t3/sale/SaleEventDetail?eventId=8328245&dispatch=loadSelectionData. The first 300 people through the gates will receive a free Anniversary Koozie! Quad Cities’ own, Corporate Rock, brings a little bit of everything to the stage. Playing hits from the 60’s, 70’s, 80’s, 90’s, 00’s and New Country, there’s something for everyone to enjoy! Band members Brad Benny (guitar/vocals), CJ Cervantes (drums/vocals) and Ian Farmer (bass) will guarantee you have a good time. Corporate Rock was founded by Brad Brenny in 1996. This 3-piece power rock trio has played over 1 million shows at nearly every venue in Eastern Iowa/Western Illinois. The band opened for Ted Nugent in 2002 and currently plays with some of the best regional bands. Brad Brenny went to Musicians Institute in Hollywood California for the Guitar Institute of Technology programs from 2003-2004. C.J. Cervantes has music in his DNA and is the driving force behind the band. Bill Bryant keeps the low-end thumping on the bass guitar! Do not miss the party of the year this weekend, in the District of Rock Island!